In this article, we look at how to measure productivity in the contact centre – looking beyond the traditional efficiency-based definition. Too often people try to apply factory logic contact centre productivity, by trying to measure calls per hour or by finding a percentage for occupancy. Yet, these calculations are based on staffing levels and your service level objectives – not how hard advisors are working. “In Service level-based environments, contacts such as calls, live chats and walk-ins arrive randomly. So, at any point in time, your Team Members are either engaged in handling a contact or are waiting for a new contact to arrive. If your Agent is 85% occupied for any given period that means, by default, they are experiencing a 15% available rate over the same period. But those 9 minutes – spread over the course of an hour – come in bits and bursts. 5 seconds here…42 seconds there…1 minute here and so on. A contact centre is not a factory, so productivity cannot be measured by efficiency. No, that is the simple answer. An advisor’s “available rate” is dependent on call patterns and how well the contact centre is staffed, it is not a valid indicator of how well they are working. 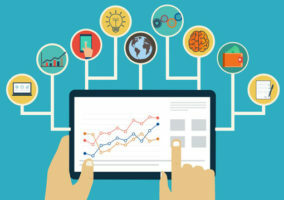 So, to measure advisor productivity, contact centres must look to use a set of metrics that does not include occupancy or calls per hour/day/week. Adherence to schedule – this is always the ‘biggest’ ingredient – when advisors adhere, service level stabilises and that’s what matters. This is a metric that advisors have a high degree of control over. Some level of Average Handling Time (AHT) – this should not have a high weighting (0-15% maybe) on the overall productivity score, but this is something that some managers still want to include, just to let the team know that it’s something they look at. Some people like to break out auxiliary (AUX) time separately – no problem, but just remember AUX is nothing but a subset of Adherence to Schedule – so it’s a business decision, if you need to break it out. Some service level – you can’t target an advisor against service level performance, as they don’t control service level. But, some contact centres base 5-8% of their overall productivity measure on service level because when service level works life is good and when service level doesn’t work life is not so good. So, it’s a “we’re all in the same boat” type measure. The weighting of each of these four elements in productivity calculations would vary somewhat depending on the industry and nature of contacts handled. 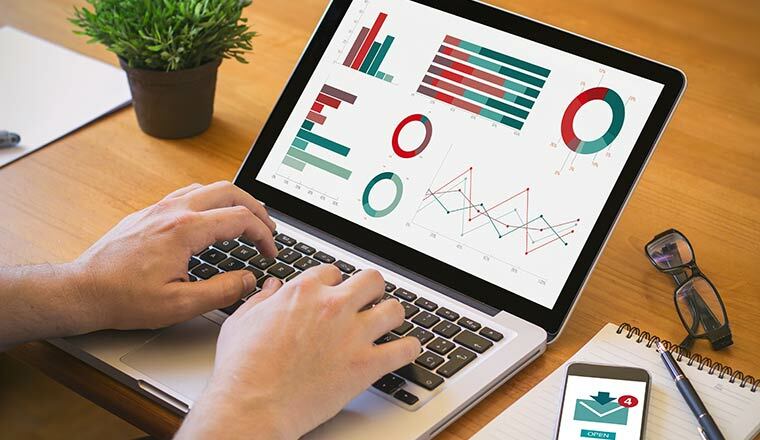 There are many metrics that some contact centres use in their advisor productivity calculations that may offer a false representation of how hard individual team members are working. Including the number of contacts handled over a certain time period – Never do this for service level-based contacts. Many people within the industry don’t know the difference between service level and response time. Occupancy – This metric is an important metric for management, because it gives them a percentage for how much of their resources are being used. But, it is not a great measure of productivity. Why? Because if you want to maintain a good service level, you need to keep some advisors in “reserve” to handle random contact arrival patterns. Also, you need to keep occupancy under 85%/90%, if you want to avoid advisor burnout. In addition, occupancy highlights the advisor experience. No, you can’t target it, but you must know it, budget and plan around it at senior level. However, this is a complex high-level function, which few do correctly. 100% (or a large percent) AHT – If advisors are targeted on AHT, as an indicator of their productivity, it is likely that they will begin to rush through calls. This takes away from their ability to listen properly and it can also drive other negative behaviours. Dave Appleby, a Resource Planning Expert, also takes issue with using the three metrics about as a productivity measure. Productivity and efficiency tend to be used interchangeably at Senor Levels. But, they are very different metrics. Productivity is based on the levels of output, whereas efficiency is more about reducing waste. It’s alright to say that you want to run an efficient contact centre, you just need to define what that looks like. While productivity can be a good measure in the contact centre, it is important to also measure quality. This is because contact centre effectiveness is generally made up of 50% productivity and 50% quality. However, when it comes to quality, quality scores shouldn’t be used in isolation. Voice of the Customer (VoC) feedback should also be included in quality calculations. 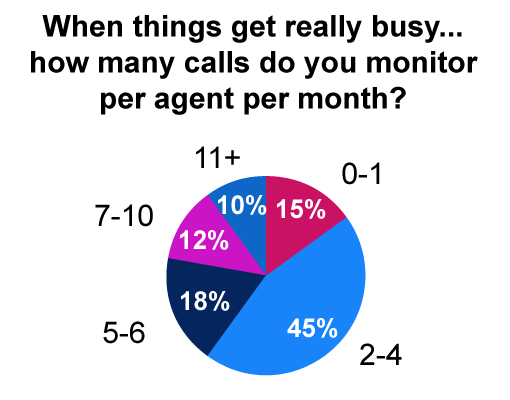 This is important, especially as we found that most contact centres measure four or fewer calls per advisor, every month – as highlighted below. So, an advisor’s quality scores should be based on more than a handful of interactions, as scores may only reflect luck of the draw. Also, when you are measuring quality beyond the advisor level, customer feedback can also indicate how productive your contact centre is as a whole, i.e. how effective your processes and technology are. An advisor can do everything right during a contact centre interaction, but poor self-service design, for example, can let the contact centre down later in the customer journey. Remember, productivity does not start and end with advisors. It is up to management to provide them with the right tools to do the job and try to make the customer journey as smooth as possible. Customer journey mapping is a useful tool for doing this. When we asked our readers and other industry experts for their thoughts on this topic, and some of them replied with useful tips which should be considered when measuring productivity in the contact centre. Here are three tips which will help you to avoid the pitfalls calculating productivity. 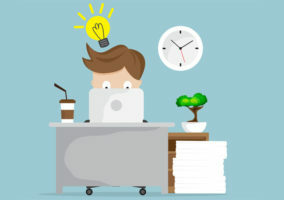 If shrinkage activities are included in efficiency measures (your occupancy and calls answered metrics), the calculations will indicate that the team are being a lot less productive than they actually are. To be clear, shrinkage includes any scheduled/unscheduled contact centre activities that take advisors away from the phone. This means that shrinkage can include holidays, absence and lateness, as well as coaching, team meetings and one-to-one time. 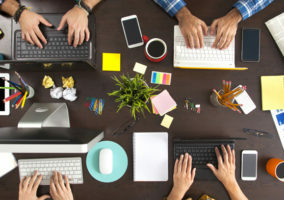 This is important, because if the team believe that their productivity is being measured simply through efficiency, they could rush through calls or even, in extreme cases, play tricks to end calls quickly. These tricks could include advisors pretending not to hear the caller, so the customer hangs up and calls back. The customer then gets put through to a different advisor and the “trick playing” advisor gets sent to the “back on the pack”, having already “handled” their call. At a management/Workforce Management (WFM) level, you can’t understate the importance of accurate forecasting. There are great industry standards that are related to the levels of accuracy of forecasting. Great forecasting = the first level of efficiency in the contact centre. 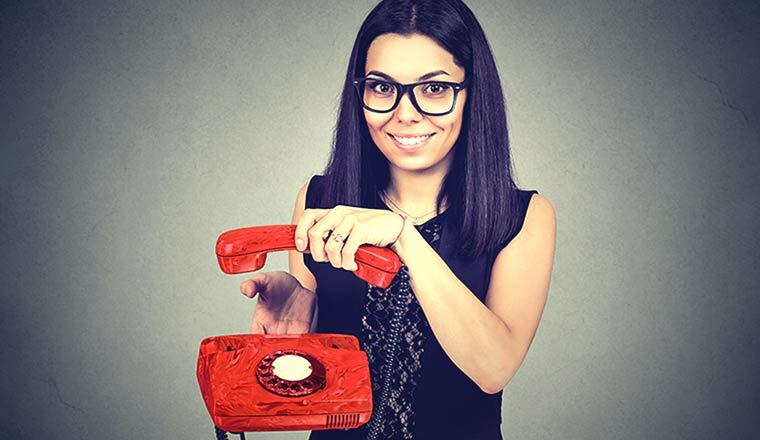 Another great source of efficiency is to eliminate unnecessary repeat contacts. That is the power of First Contact Resolution (FCR). By looking at root causes and fixing them, you can reduce repeat contacts and consequently boost FCR. Eliminate these repeat contacts is an excellent source of efficiency and is arguably best summed up by the title of Bill Price and David Jaffe’s 2008 book: “The Best Service is No Service”. To gain a good view of your contact centre’s productivity, it is important to avoid measures that are based on call arrival, such as calls per hour/day/week and occupancy, and focus on metrics that advisors have some control over. So, contact centres should have a group of metrics to measure productivity, but schedule adherence should be given the greatest weighting. Yet, it is also important to remember that productivity doesn’t equal effectiveness – quality must also be considered when evaluating effectiveness. Not just quality scores though, quality scores mixed with VoC feedback.